Hire the Millennium Falcon! 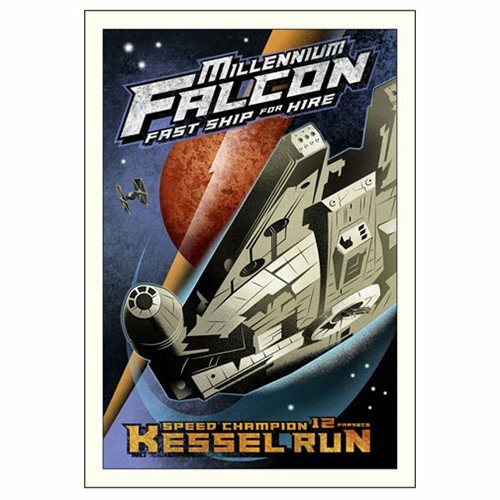 This Star Wars Kessel Run by Mike Kungl Small Canvas Giclee Art Print looks like a cool retro advertisement poster featuring the Millennium Falcon speeding away from a TIE Fighter, with the advertisement reading, "Millennium Falcon: Fast ship for hire. Speed champion. 12 parsecs Kessel Run." A limited edition of 95 hand-numbered pieces on canvas, this beautiful piece of art has even been signed by the artist! Measures 26-inches tall x 18-inches wide and comes complete with certificate of authenticity.